Amazing VIEW & Brand New Unit! ~ Top Oceanfront Resort! Sandcastles Unit #413 is proudly owned by 'Stay In Cocoa Beach', the largest owner of premium beachfront vacation rentals on the Space Coast! Unit 413 is a clean and spacious (1,300 sq. feet) 4th floor unit directly on the beach with a beautiful south facing ocean & beach view! This gorgeous condo was newly renovated and boasts many excellent unit & complex amenities. Whether you are getting away to relax or looking for fun for the whole family, this condo will exceed your expectations! For your entertainment, the condo is equipped with in unit WiFi & 3x big TVs so you don't have to miss the big game! 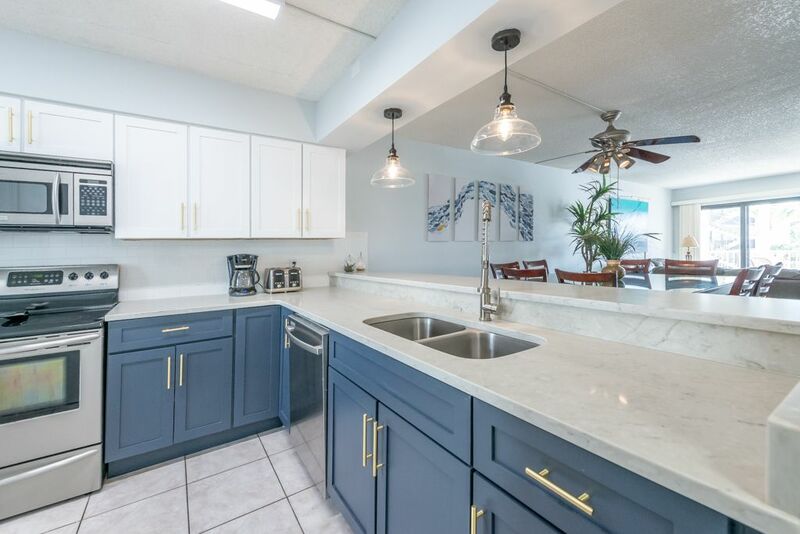 You also don't need to dine out every night (although you could with all the restaurant options very close by) as the condo has a fully equipped kitchen that will make you feel at home - meals and morning coffees can be enjoyed overlooking the ocean on your spacious balcony. For your convenience, this condo has a laundry rooms with a full size W&D and is stocked with everything you will need for the beach! The condo comfortably accommodates 6 people (king in master, 2 twins in guest & a queen sofa sleeper), all with high quality/thread count linens and fresh pillows & towels. * Beach items included: 2 beach chairs, towels, boogie boards, beach mat, umbrella, etc. Cocoa Beach is only 30 minutes from the Kennedy Space Center & an hour to Orlando Airport and all the excitements of Disney world; it is also home to many great golf courses, restaurants, places to shop and much more! Although the listing states "no refund", we understand that things come up. If you have to cancel your reservation and you notify us at least 30 days before check in or earlier, we will not charge the second half of the payment. Hello travellers! We're the 'Stay In Cocoa Beach' family and have been hosting families like yours for over 10 years. Choosing us means: • The largest selection of beach-front properties, so you can find the perfect spot for your getaway • Quick and easy booking and check in • A property with everything you need like beach supplies, free WIFI, linens, towels & more • Direct communication with our family, the owner, not a third-party property manager • Peace of mind! -- We are the proud recipient of Flipkey's Top Vacation Rental award and all units are fully licensed and registered We're looking forward to having you for a fun, carefree vacation with family and friends! Overall stay and property was very good! Dean the manager and staff member Ron were very professional and efficient in answering any and all concerns. The unit had been painted prior to our arrival and several replacements of items were handled by staff. We did discover the micro wave did not function as expected and will be replaced . The balcony door screens were rescreened but the frames continued to stick or go off track. The unit was clean and stocked with cleaning and paper supplies. Aside from the items mentioned above, we would recommend the unit for a family of four or six ! The general property, pool, grounds, access to beach were excellent. parking is not a problem and private. We would recommend Sand Castle to anyone looking for a relaxing time. One of my favorite locations-definitely will be back!!!! We recently stayed here for 9 days. This quickly became one of my favorite vacation spots. The condo was clean and spacious and I felt extremely secure when staying here. It was me, my 2 daughters and my granddaughter. There was plenty of room for all of us and EVERYTHING that is needed was already in the condo including beach chairs and a cooler!!!! Since it is located right on the beach this was super convenient for us! The view from the balcony was perfect! It is right in the middle of town and even close enough to drive into Orlando(about an hour away) like we did to enjoy horror nights at Universal. There were plenty of restaurants close and all kinds of shopping from groceries to souvenirs. I hate to let the world in on this great little place by this review but I will be going back for sure over and over!!!! There was a private pool and hot tub also located on the property that was very clean and just a few steps from the room!!! I seriously could not have ask for a better place to stay and super safe for our little girls trip!!!! Thank you, Dean, for everything and making us all feel so at home with your place!!!! We had a great week at Cocoa Beach. The apartment is very large and great for families to spread out. Kitchen is well appointed with lots of utensils, even a blender, and we enjoyed having 2 bedrooms and bathrooms. Plenty of pool and beach toys, chairs, etc. conveniently located in the closet by the door. Easy access at all hours with a code to enter. Pool was nice, view gorgeous, and the beach is terrific. It's low-key and relaxing. We enjoyed our stay! Best decision by far! All the comforts of home! Our stay at Sandcastle unit 413 was the best! Very comfortable beds, very clean! Dean was quick to answer any questions and friendly! Highly recommend! The property is well maintained and very clean ! This is the second time we have stayed at this property and love the cleanliness of the units and easy access to the beach area. Everyone is so friendly that seems to stay here from all parts of the country. Balcony view was very nice put was expecting a little closer but it was nice all the same had breakfast there every day. Can’t wait to return next year for another week or two ! Recommend to everyone from a group family to just a couple wanting to get away ! Clean, right in the beach, beautiful views, just what we were looking for! Thanks for the great stay!! Complimentary Gym Membership - Full gym located right across the street!! !